My neighborhood here in Nice feels like a little microcosm of modern France. From my balcony I can see the ethnic diversity and historical layers that make up the area. I love the combination of cultures that come together here. As I try to make this foreign city home, I am in good company with all of the immigrants who have come before me. The crumbling Belle Epoque facades must have housed sumptuous interiors at one point. From what I’ve gleaned, this area was quite upscale before it succumbed to the seedy grime that usually surrounds major train stations. Since then it has been in a protracted decline, large family homes have been turned into cheap hotels and apartments. Pizza and kebab shops abound. But I feel safe here. Like any self-respecting French neighborhood, the necessities are all at arms reach. There are no fewer than four boulangeries, two medium sized grocery stores, a pharmacy, a post office, countless cafes and butchers, and vegetable stands, a fishmonger, and a jazz club within a two-block radius of my apartment. Right below the apartment and on either side, the buildings house traditional southern French establishments: longstanding cafes and restaurants that cater mostly to tourists and some locals. 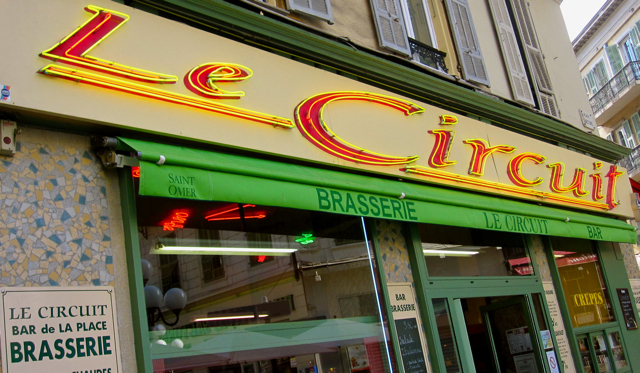 Each morning, the metal grates are flung open at Le Circuit Bar – with one of the best neon signs in Nice – where espressos, croissants, and tartines are served up just as they have been for decades. The outdoor tables of Lou Pitchoun and Cafeine across the way fill up just as fast and plates of pain au chocolate and steaming cups of cafe crème come and go until mid afternoon. The next shift belongs to the likes of Café Saetone, the picturesque Italian restaurant, whose tables are occupied most evenings. The little trattoria has perfected a welcoming atmosphere that seems to attract tourists like flies to honey. The red and white checked tables are perpetually laden with fragrant pastas and carafes of wine. As the sun sets, the scruffy, wizened accordion player takes his regular place on this street corner as he has done since he was a young man. His adult son, who has trailed him since he was a little boy, now takes turns with him as they provide a soundtrack to the night. Their melodies drift from the clinking of silverware at Saetone over to the white plastic tables of Le Petit Biche, which looks like it has been serving classic rich French fare since the beginning of time. As my gaze moves further south, the population shifts. This is where the Muslim section of the neighborhood begins. Here, the tourist spots mix with Internet cafes selling North African art and clay tagines along with phone cards and coffee. 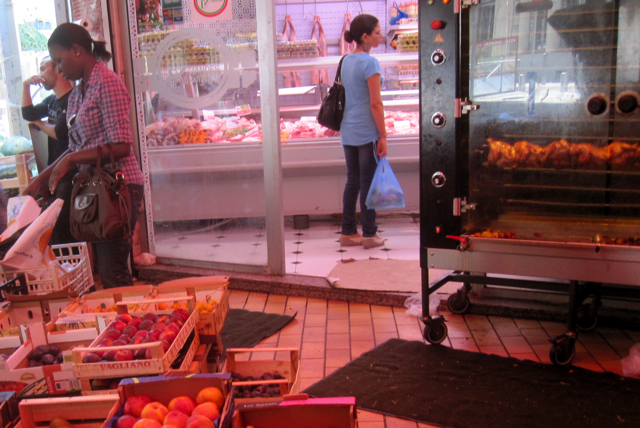 Small Arab grocery stores line the sidewalks here. Bright butcher cases full of Halal meats sit inside each one and glistening rotisserie chickens slowly brown as they spin skewered in their metal ovens out front. Luckily for me, these shops have by far the best prices on fruit and vegetables in town. It was surprising at first to see the throngs of Muslim men, some dressed in traditional garb, some wearing jeans, almost all of them clutching small plastic cups of vending machine espresso, standing and sitting in small groups chatting and smoking. The men are out on the streets here in such large numbers at certain times of day because of the mosque two streets down. The small interior can no longer hold the expanding population, and people spill out of its doors, around prayer times filling the sidewalks on either side and across the street in the parking lot behind the grand white Notre Dame Basilica. The mosque has been here for over a decade, but time doesn’t seem to have made it any less controversial. The larger debate over immigration is raging in the country, and has been heightened by recent shootings. As voters go to the polls on Sunday, Immigration, and particularly Muslim immigrants is a key issue. Tensions are especially high here in Nice, which has a reputation as one of the more conservative cities in the French landscape. France’s far right Front National party has historically done well here. I’m fascinated by the history here and want to know more about the neighborhood. I have been trying to cultivate a friendship with the tiny and stylish Frenchwoman who lives a couple floors above me. She invited me in for tea the other day and told me she’s lived in this building for more than 20 years and she’s seen many changes over the decades. I was momentarily shocked when I stepped into her apartment. The main layout is the same as mine, but over the years, she has meticulously remodeled her home room by room and the result is a gorgeous classic interior. She explained that a couple of years after she moved in, the neighborhood really started to go downhill, but despite the crumbling buildings and pockmarked sidewalks, the area has never felt unsafe to her. There is a bit of an edge, but I’ve never felt any danger either. I’ve actually never even been remotely bothered by anyone here. Maneuvering through the crowds of men took a bit of getting used to, but I have an allegiance to my little piece of Nice. I now watch in anticipation along with my neighbors as new establishments open and others shut. 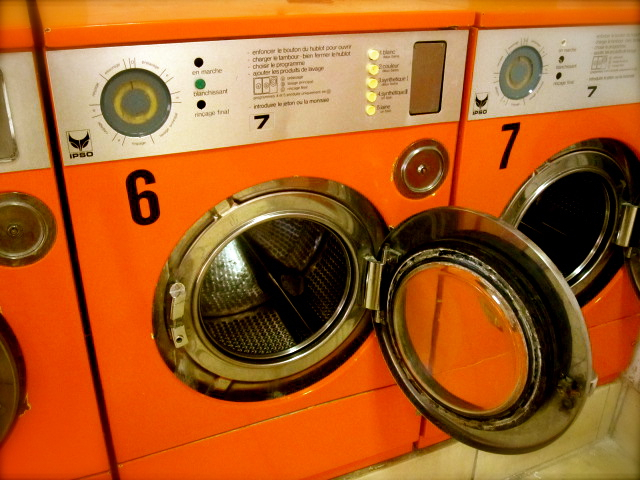 The latest gossip is that the long abandoned olive oil shop across the street will soon become a new Laundromat. We are waiting with bated breath. Great pictures and enjoyable writing. Out of curiosity, how long have you been blogging? I’ve looked through some of your past material and it’s pretty good. If it’s OK with you I may want to reblog some of it in the future on our small startup site. If that would be OK please let me know. Cheers and congrats on the great work. Thanks for looking and for the kind words. I’d like to know more about your start up. How can I contact you? The slow drift North, people migrations continue today just as they have done for centuries, witnessed by the few who stay in one place and capture a moment in time. It sounds like you live in an interesting and diverse community, the best of both worlds. Absolutely. There is a little of everything in this part of town. I love it.